Touted to be one of the few best burger joints in the city, The Daily Grind has been serving gourmet burgers at Bangsar Village for years. The diner makes everything from scratch from grinding their own meat for patty to all the condiments such as sauces, pickles and more. I have yet to make a visit for their burgers but my foodie friends have been raving about the burgers here. One fine Saturday, I was invited to The Daily Grind to catch a sneak preview of the new brunch menu. I love brunch. The thoughts of the word brunch usually means some lovely indulgence since I am going to combine my breakfast and lunch into a meal. I also love surprises because brunch menu is pretty creative and always involves eggs, bacon, waffles and other goodies. 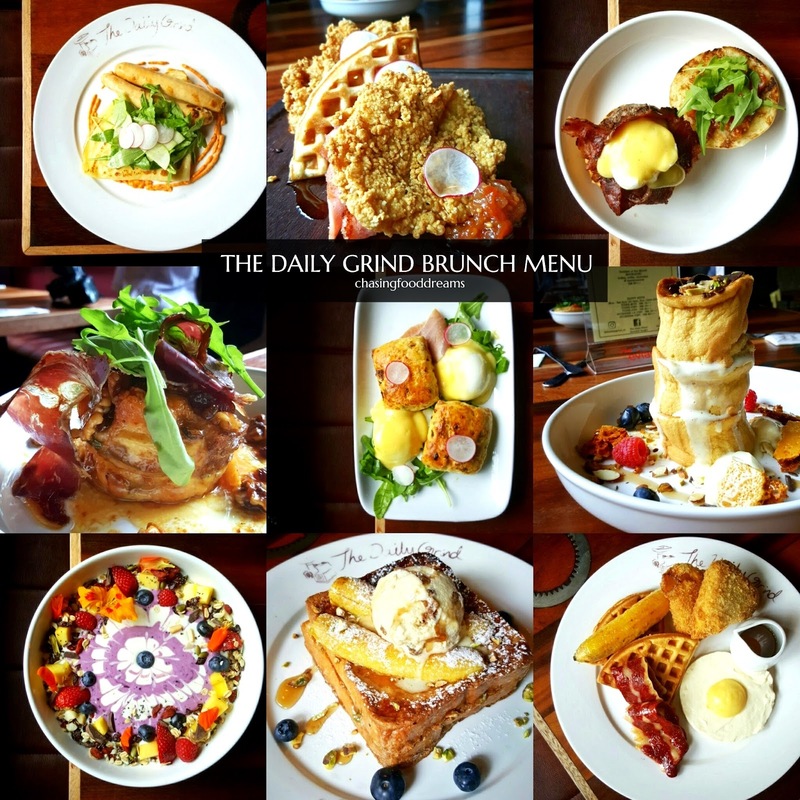 The Daily Grind’s brunch menu is available weekends from 9am till 2pm. The diner offers nine brunch dishes, plenty of choices for everyone. Enjoy hearty comfort dishes from eggs, bacon, pancake, waffle and burger to healthy and fruity treats. Latte and fresh Apple Juice to kick start the day! If I have to pick a favorite on the brunch menu, it would have to be the Smokin’ Seaside Scones (RM28). The dish takes the much beloved eggs benedict version and jazzed it up to such a scrumptious and creative dish. Featuring two house made crumbly and moist onion scones served with perfectly two poached eggs, smoked tuna, smoked snowfish, rocket leaves and finished with a generous lashing of hollandaise sauce. What I really enjoy the most is the onion scones with the egg and hollandaise sauce. The flavors just worked so harmoniously. The smoked tuna and snowfish is a bit unusual but pretty good and makes a nice change from the usual smoked salmon. I like how the rocket leaves and crisp radish lighten up the dish. Napolean & Churchill (RM25) may sound to be the odd pairing but savory crepes with house made chicken sausages turned out to be a great duo. The soft thin crepe with cheese is made savory with the juicy sausages. The sausages has a surprisingly solid bite and the flavors goes well with the lightly sweet and creamy romesco sauce. Again the dish is balanced up with dressed rocket leaves, crisp apple slices and radishes. Burgers are their specialty and without a doubt, there is a burger option for brunch too. Burger Me Breakfast (RM27) has a thick and juicy beef patty, beef bacon and poached egg with hollandaise sauce and tomato jam served on toasted brioche bun. It seemed to be healthier burger version with the delectable oozing poached egg instead of the usual fried ones. The luscious hollandaise is nicely balanced by the tangy and sweet tomato jam. It’s breakfast on a bun! More savory brunch dish and this one happens to be the one I would order at a glance. It’s been a while since I have had Waffle & Chicken (RM22) and I couldn’t be any happier to know that now I can get my waffle and chicken fix at The Daily Grind. The fried boneless chicken thighs are so crispy and moist as well as tender and tasty. The savory flavours goes well with the aromatic eggy waffles and sweet maple syrup. While some may think its odd on adding maple syrup, I love the sweet and savory combination of flavours. Beef bacon and tomato jam are also added for more oomph. Herb Brioche Pudding (RM29) is another showcase of sweet and savory. The fact that the younger generation seemed to enjoy sweet and savory together, this dish will certainly do well on the menu. A warm and egg brioche pudding is served with salty air fried beef, generous drizzle of salted caramel and rum (yes, alcohol for breakfast, how lucky can we get! ), finished with rocket leaves, sultanas and walnuts. The dish is really rich and sublime so sharing it may be a good idea too. I enjoyed the decadent savory and sweet flavors a lot, especially that salted caramel with rum sauce! When I saw my next diner’s stacked Pancake Souffle (RM23), I thought it was such a pretty dish of pancakes. Although the pancake was thick, it was one of the lightest pancake I have ever had. The soufflé pancakes are served with lemon cream, crunchy honeycombs, berries, nuts and chocolate bits. Quite the unusual pancake but it’s delicious with its medley of flavors and textures. If the earlier bunch proved to be too sinful for you, then opt for the pretty and healthy Goddess Bowl (RM22). House made yoghurt packed with textural goodness of pumpkin seeds, goji berries, crunchy oat, coconut flakes, fresh mango and berries and berry coulis sounds too good to be true but is beautifully delicious and perfect for a weekend treat. Last but not least, we are left with The Mockery (RM18). A full English breakfast may not be what it seems on this plate but nevertheless, who can resist this adorably disguised breakfast dish. I don’t think I want to disclose what The Mockery offers so you’ll just have to order this to enjoy it. Hint… it’s sweet and not savory! The Daily Grind may not have started their brunch early like others but I don’t think it’s too late to join the brunch wave. We enjoyed the generous portions and creative nuances of their brunch menu tremendously. The brunch menu offers something different and delicious so it definitely warrants a few visits to try them all. Psst… I heard that The Daily Grind Gourmet Burgers is opening a second outlet in Jalan Ampang soon… stay tune! That burger looks good, bacon, beef, and egg, simple combo that never disappoint. Yeah, I love brunch too!